We offer 130 pitches separated by hedges for tents, caravans or camper vans. 2 sanitary blocks (showers and toilets) are located nearby. In addition, each pitch has a 10 amp electrical connection. Finally, for visitors staying at our campsite in camper vans, we also provide a free emptying area. We offer large locations adapted to the size of your vehicles. Each pitch is bounded by hedges, and an electrical outlet is at your disposal. 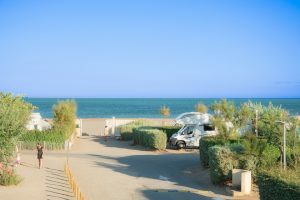 Some pitches are directly on the seafront. 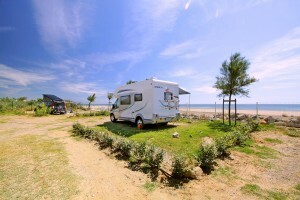 Everything is provided for the comfort of motorhomes: the pitches are large to facilitate your installation. In addition, a collector for chemical toilets is also available. We have 2 sanitary blocks that we clean daily. 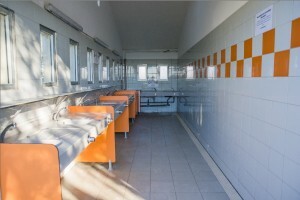 They include showers, washbasins and toilets for women and men (separated in toilet block). Finally, one of the blocks is suitable for disabled guests. You can’t be closer to the sea! 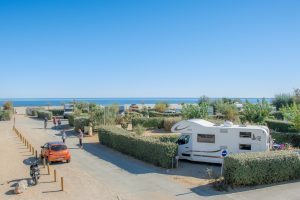 2 accesses allow you to go to a the beach directly from the campsite.